In the AJ aircraft we had very sophisticated bombsight radar because our mission was to drop atomic bombs on hard-to-see targets from the then almost unheard of altitude of 45,000 feet. The Radar system was capable of picking up a reflective target, even a small one, from high altitude and we would be expected to drop the bomb based on its accuracy. This Radar even had a photographic capability that allowed us to replay the screen, after the drop, so that we could analyze the results later. It was great radar! With that kind of accuracy and precision, someone thought that it might be possible to spot the exact moment that a bomb exploded and then follow-through to see what would subsequently happen. Bomb-damage assessment! The question was, could this sophisticated radar be used to do that? In 1955 they were still testing atomic bombs at a facility somewhere about 65 miles north of Las Vegas. This was a reasonably short flight for our planes, and the decision was made to have two of our aircraft circling the site at high altitude, with radar on, to record the blast. The blasts were not done on a regular basis since they had to take into account myriad factors like wind direction and speed and upper air turbulence, etc. and they were always conducted somewhere around 0300-0400 hours when the public would rarely be awake and observing. Our mission, then, was to await word of a pending explosion, launch two aircraft some time just after midnight, climb to altitude and circle at about 20,000 feet with the radar on to await results. 95% of the time this was a futile operation and the bomb would not be detonated, but on this one occasion, when I was involved, things changed. On this occasion I had taken off a bit after midnight with my companion plane and headed out, crossing over Los Angeles, on heading. We arrived at the rendezvous point ahead of schedule and began our flight circle. But then my starboard engine began to act erratically accompanied but a decrease in oil pressure. Not good! I feathered the propeller, called my airborne pal and told him we were returning to base. It took about an hour and a half to get back to the base, and even though there was really nothing to worry about, I was still flying on only one engine and prudence dictated that I get back on the ground soonest. NAS North Island has two runways. One is roughly oriented east/west and the other north/south, and since there was virtually no wind and the north/south runway was essentially a straight in approach, I elected to land that way. I made a normal descent and passed over the end of the runway at about thirty feet and touched down quickly in the first third. THEN it happened! The sky flashed and lit up, and my immediate thought was that the starboard engine had somehow blown up. I couldn’t see the engine since the pilot sits on the left side and my bombardier/navigator was opposite me on the right side and in the way, so there was nothing to do but keep the roll-out straight and hope for the best. And then everything returned to normal. The sky darkened once again and happily I didn’t see any flames or see any of my instruments fluctuating. What had happened? They had finally detonated the bomb, and even though it was near Las Vegas, about 400 miles away, the explosion was so intense that it lit up the sky all the way over California. My God!!! And I was supposed to drop one of these bombs if I was called upon!!! The final question. Did the radar on my pal’s plane detect the blast and reveal subsequent damage. NO! And the other question – never asked or answered – how much radiation did the other crew receive from this nuclear blast? We will never know, but I will take a night, single-engine cross country flight, and single engine landing instead, anytime! After I wrote the above story, it occurred to me to see if “Operation Teapot” would mean anything on Google. To my surprise it did! Teapot was authorized by President Eisenhower on 30 August 1954. This series of fourteen shots proof-tested a broad variety of fission devices with low to moderate yields. As a group these devices combined several innovations – some previously tested, some introduced during this test series – to create a new pattern of fission device that would dominate the design of all later weapons. These devices used new compact, efficient, light weight spherical implosion systems; beryllium tampers; hollow cores; deuterium-tritium boosting; and the use of neutron pulse tubes as initiators to create light, compact, efficient, and reliable fission explosive systems. These devices were tested for a broad variety of tactical weapon applications, including air defense (AD) and anti-submarine warfare (ASW). 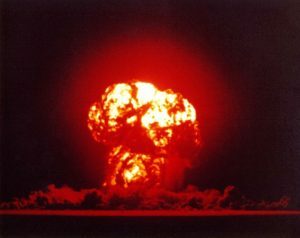 Several new primaries were tested for a new generation of lighter and more compact (Class “D”) thermonuclear weapons to be fired in 1956 during Operation Redwing. My Teapot released some 24,500 kilocuries of radioiodine (I-131) into the atmosphere. This produced total civilian radiation exposures amounting to 41 million person-rads of thyroid tissue exposure (about 11% of all exposure due to continental nuclear tests). This was expected to eventually cause about 13,000 cases of thyroid cancer, leading to some 650 deaths. Chart of fallout exposures from Teapot (58 K, 539×577). From National Cancer Institute Study.